On these Saint Patrick’s Days in recent years, which correspond to significant centenaries in our history, I have taken, each year, since 2014, a human starting point, personal or local, as a springboard to our reflection about ourselves in contemporary Ireland: the First World War, the Easter Rising, and the Somme. In the year since we last gathered here to mark our national Saint on our national day, 100 years ago, my own grandmother would have received the news during the winter past that her husband of less than one year had been killed in action. The week ahead, one hundred years ago, saw the start of the so-called Spring-Offensive. Germany realised it had to try to get the war all sewn up before the full might and resources of the USA were deployed. In four days time in 1918, the focus would once again be on the Somme and Flanders. By 23rd March there would be massive losses and, effectively, the 16th Irish and the 36th Ulster Divisions will have collapsed. In April 1918 plans to introduce conscription would result in a popular and a political backlash. That May, the first instance of the Spanish flu would be recorded in Ireland; the flu – ‘no respecter of religious sensitivities’ as historian Ian d’Alton puts it, or differences of any kind for that matter. He points out that more than 800,000 would catch the virus, that 23,000 in Ireland would die. 23,000 and 35,000 in the First World War. And the war would be over, sort of, by November. I say, ‘sort of’, because countless homes and communities would live forever with the fallout; people like my own grandmother who silently carried the loss until her death when I was 5 in 1965, and whose second husband, as I myself witnessed, put on the special boots every day to accommodate his war time wounds, until his death in 1971. From you to me to them: that’s just one degree of the so called degrees of separation, through me, to the grief and wounded of that war 100 years ago. That human connection is repeated in a myriad of ways here in Ireland and throughout the world. In the coming week, in the first 3 days of that Spring Offensive, from this Diocese alone, 11 young men would be killed in action; names which would eventually be included on that memorial there; ranging in age from 19 years to 36. Seven of them died on one day – 21st March: Arthur Anderson (Church Street, Dunmanway), Charles Bateman (Upton), Fenton Cummins (Glanmire), Charles Lowrey (Mitchelstown), Fred Oakley (31 Thomas Davis, Street), Victor Perrott (Bandon), and George Skuse (Skibbereen). And on the following days of that one week these: William Butler (Gardiner’s Hill), Henry Eason (Shandon), William Crosbie (Cork City), and William Henry Madden, son of the Dean of this Cathedral, Dr Samuel Owen Madden, who was married to Bishop John Gregg’s daughter, Charlotte. By the time we meet here again next year, there will have been the General Election in December. Women will have voted for the first time. Dáil Éireann will meet for the first time on 21st January 1919. All of those move our commemorations on to a new phase. What is the role of the Church, of Christians, in all these commemorations? In our ‘life together [we are to] be a witness to [Christ’s] love in this troubled world, may unity overcome division, forgiveness heal injury, and joy triumph over sorrow …’ Fergal Keane, whose mother taught me English in Ashton School (my claim to fame), calls his very personal book about this period: ‘Wounds’. In the years ahead we will undoubtedly give thanks for the birth and emergence of our nation, but we also do well to realise that there are indeed still ‘wounds’ to be tended to and healed. We also need to be vigilant about entirely new wounds of division which may be emerging as a product of our own times. When I spoke last August in Dunmanway about some of these things at the opening of the new Sam Maguire Community Bells, the reactions themselves bear this out. There was a whole spectrum of responses: positive and negative, encouraging and abusive, fearful and confident, engaging and intelligent, and sadly, a few ignorant and sectarian. One man said: ‘I admire your courage talking about those things here in Dunmanway.’ Another said, ‘You’re some fool.’ Perhaps, but as Saint Paul said ‘we are fools for Christ…’ And when it comes to what he also called ‘the ministry of reconciliation’, we have to use our imagination and to take risks, risks of engaging with one another – sharing our stories and our histories, meeting for dialogue, and discovering the common ground in our humanity. I found that, in doing all those things in our 1916 commemorations, I met all sorts of people and heard their stories in a way that was enriching and transformative. For that reason I began to work on a project that I am announcing here publicly today for the first time, and I ask you to join us, in this Diocese, in partnership in it. I took advice across a spectrum of backgrounds and disciplines. I tabled it as a draft at our Diocesan Council last September. It recognises that Cork figures prominently on the national stage in the centenary years that are to come; that Cork, in many ways, was one of the most violent places in those years. 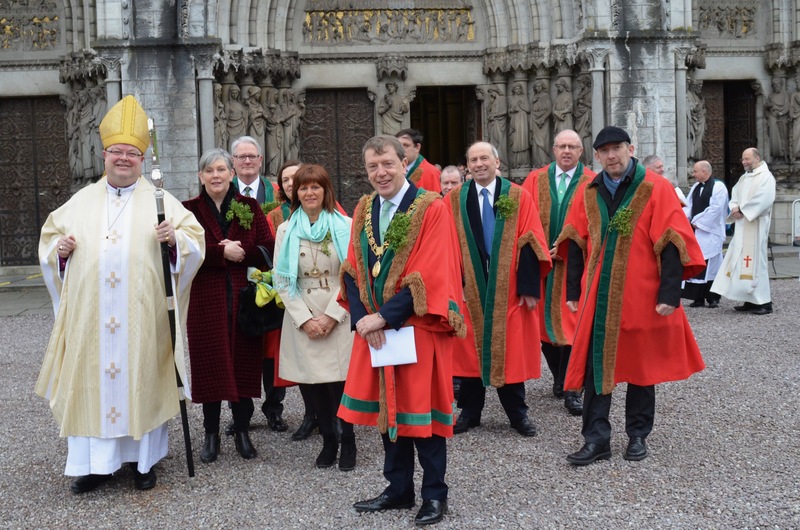 I am glad to say that nationally, the Church of Ireland, through what we call our Church of Ireland Priorities’ Fund, has recognised this too and, earlier this week, agreed in large measure to co-fund this initiative which I am calling the Cork, Cloyne and Ross Commemorations and Reconciliation Project. It will have two distinct phases, corresponding first to the commemorations of the War of Independence, and then of the Civil War. In announcing it here today, I want to signal that I will be engaging with many of you from many different perspectives about it in coming weeks to ask for your input and partnership. I hope that in the Civil War commemorations we might initiate a walk of witness to our diversity and our togetherness, all over this city and county – perhaps all over this country – a walk where we walk with, and talk, and perhaps even hold hands with, people so different from ourselves that now, we could not ever imagine holding hands with. But by then we might! To us is entrusted, says Saint Paul, ‘the ministry of reconciliation’ (2 Cor. 5.18) This is not only backward looking to the commemorations it involves engaging with differences here and now in our time. This entry was posted in Bishop, Church in Society, Church Services, Cork, Saint Patrick's Day, Saints Days, Sermons. Bookmark the permalink.